KREIDER + O’LEARY present EDGE CITY at the Lisbon Architecture Triennale 2013. 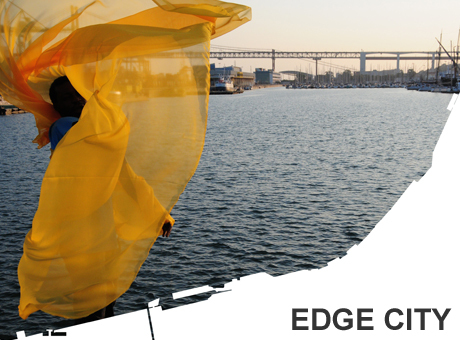 Kreider + O'Leary will present a new work entitled Edge City at the Lisbon Architecture Triennale, 2013, As part of the 'Close...Closer' associated projects selected by Triennale chief curator Beatrice Gallilee. Over the past year, Kreider + O'Leary have been mapping and recording the maritime edges of the city of Lisbon, from the Ponte Vasco da Gama to the Ponte 25 de April. Consisting of multiple strands of performance, video installation, and city walks, the work operates at a crossover between cultural geography, video documentary, and fiction to inter-weave spatial, historical, social and political narratives of the city of Lisbon. On the opening weekend of the Triennale, Kreider + O'Leary will conduct a mediated performative tour of the maritime edges of the city, starting at Cais do Sodré on the riverfront and finishing at the Museu Nacional de Arte Antiga. With archaeological levels of detail, they use performance, props, images, texts and architectural elements to explore the city edge as a locus for a number of inter-related systems. For the duration of the Triennale, Kreider + O'Leary will be exhibiting a new 9-channel video installation at Lisbon's Lx Factory. The work forms a tapestry of digital scraps and fragments, narrating stories of Lisbon’s edge dwellers and their infamous destinations. As a remnant of their engagement with Lisbon, they will leave in place a self-guided walking tour, tracing a trajectory between Cais do Sodré and Alcántara Mar. Available online, this walk engages with digitally augmented spatial practice in order to cultivate an enriched, multi-layered experience of the urban environment. - Location: Start outside the Terminal Fluvial at Cais do Sodré Station (map) at any time. Kreider + O'Leary are a poet and architect who collaborate to make performance, installation and time-based media work in relation to sites of architectural and cultural interest. Since 2003, they have worked collaboratively to construct work in prisons, churches, military sites, film locations, landscape gardens and desert environments, as well as in more traditional gallery venues across the UK, Europe, the US, Australia, and Japan. Their most recent work Light Vessel Automatic was exhibited at ‘Performing Architecture’ at Tate Britain in February 2013. James O'Leary is a lecturer in Innovative Technology and Design Realisation at the Bartlett School of Architecture.